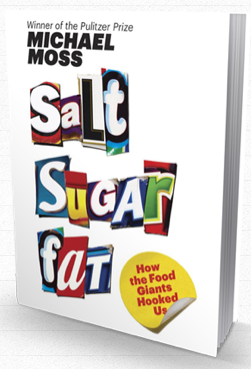 "Fascinating" and "horrifying" are two words that come to mind to describe new bestseller "Salt Sugar Fat: How the Food Giants Hooked Us" by Pulitzer Prize journalist Michael Moss. "Fascinating" because Moss provides rich, fully-sourced details about industrial food corporations using tobacco-industry tactics in extraordinarily greedy pursuit of profits, public health be damned. "Horrifying" for the same reasons. "Horrifying" also for the smooth, underhanded ways Big Food has used, and still uses, to fool, trick, and hook all of us to enrichen their corporate coffers while clearly and deliberately hurting our health. "... in attempting to trace an E.coli-tainted shipment of hamburger that had made hundreds ill and paralyzed a twenty-two-year-old former dance teacher in Minnesota named Stephanie Smith, I found the federal government to be of little help. "Not only that, the Department of Agriculture is actually complicit in the meat industry's secrecy. Citing competitive interests, the public agency refused my requests for the most basic facts, like which slaughterhouses had supplied the meat. "I ultimately obtained the information from an industry insider, and the smoking-gun document--- a detailed, second-by-second account of the hamburger production process called a "Grinding log"--- showed why the government is so protective of the industry it is supposed to be holding accountable. "The burger that Stephanie ate, made by Cargill, had been an amalgam of various grades if neat from different parts of the cow and from multiple slaughterhouses as far away as Uruguay. "The meat industry, with the blessings of the federal government, was avoiding steps that could make their products safer for consumers. The E.coli starts in the slaughterhouses, where feces tainted with the pathogen can contaminate the meat when the hides of cows are pulled off. "Yet many of the biggest slaughterhouses would sell their meat only to hamburger makers like Cargill if they agreed NOT to test their meat for E.coli until it was mixed together with shipments from other slaughterhouses. "This insulated the slaughterhouses from costly recalls when the pathogen was found in ground beef, but also prevented government officials and the public from tracing the E.coli back to its source. When it comes to pathogens in the meat industry, ignorance is financial bliss." I recommend this riveting expose to all Americans: this clever book will help you reclaim a measure of control over your life and health as you understand the nature and origins of the #1 non-genetic factor on your health and longevity. It's the fact that society as a whole thinks that its okay to harass and bully people who are deemed unfuckable. I heard that sugar becomes fat and salt becomes sugar so they both become fat.